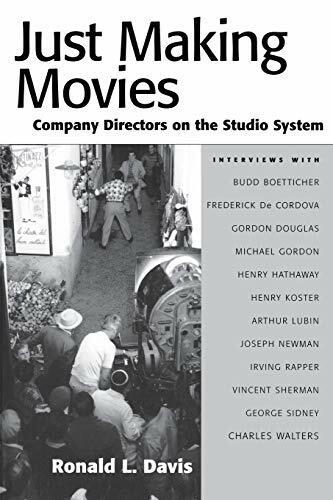 At first I only wanted to read this book, which collects interviews with twelve old-time studio film directors, for one reason: Budd Boetticher. Boetticher is the only one of the twelve who could be considered an auteur, or a filmmaker with a personal style that translated from film to film. Most of the guys in this book made very few classics between them, and certainly no films with any personal style. "I would have loved to have done Casablanca. I would have loved to have done Treasure of the Sierra Madre, but I didn't get those. I don't think that there was any concerted effort not to give me top pictures. It's just the way the schedule worked out. It's true that if you did a successful picture, you could demand a little bit more in the next one. I was always what I thought was a pretty good company man." Though Boetticher's crusty interview is the best in the book, I was embarrassed to realize that these other guys had something to teach that was just as valuable as anything Boetticher had to say. And in some cases, more so.